In this tutorial, we'll show you how to host a webpage on the ESP32 Thing that will allow you to set times for a power relay to be turned on or off. 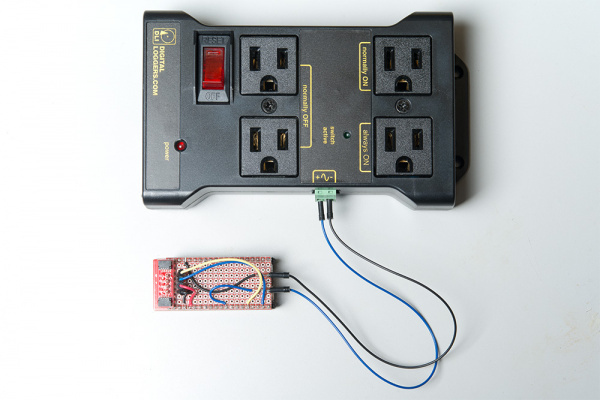 It utilizes our ESP32 Thing, IoT Power Relay, and the Qwiic Micro OLED screen to create a smart outlet that can maintain a weekly schedule for powering any AC powered load you want to cycle regularly. To follow this project, you will need the following materials. Depending on what you have, you may not need everything on this list. Add it to your cart, read through the guide, and adjust the cart as necessary. 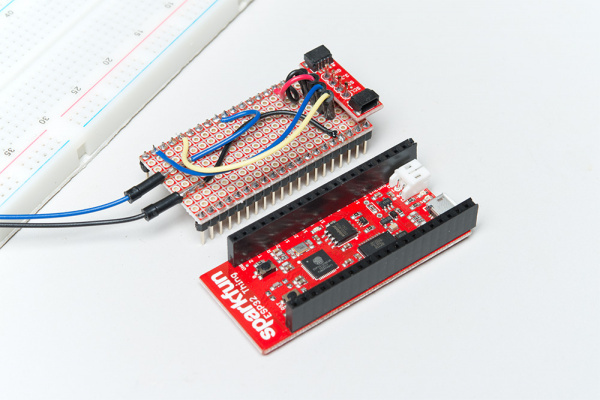 You will need the Arduino IDE with the ESP32 software support package installed. 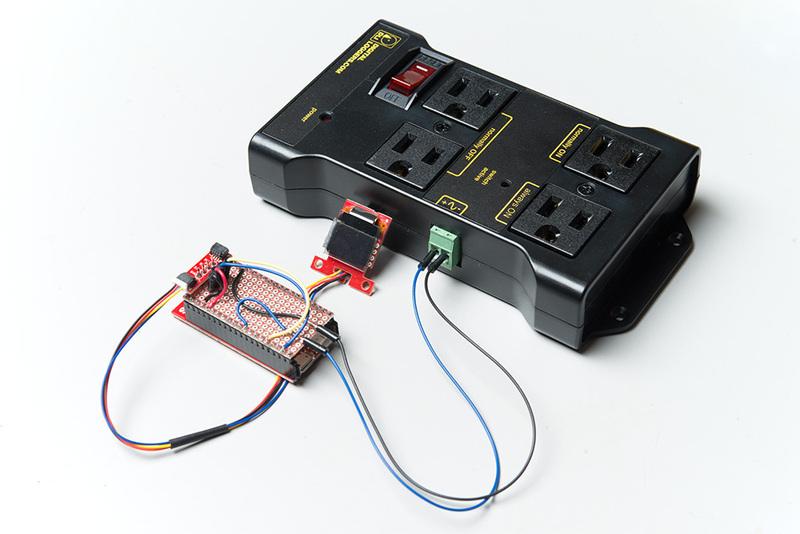 In addition, you'll need to download the IoT_Power_Relay code from GitHub. Visit the links to access the installs and code as well as more information on installing board support for the ESP32 in Arduino. 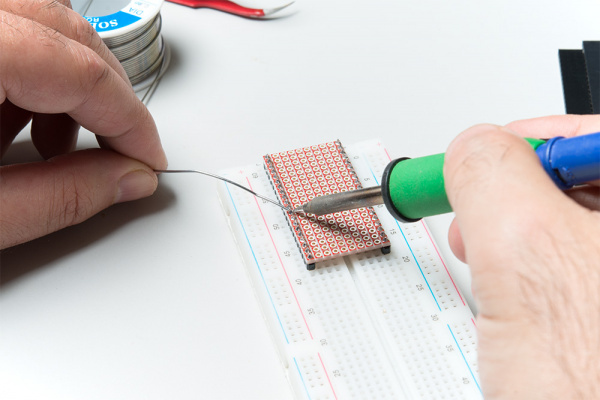 You will need a good soldering iron, solder, general soldering accessories, and a screw driver to follow along. Before undertaking this project, there are a few tutorials that you may want to review. If you aren't familiar with the Qwiic system, we recommend reading here for an overview. We also recommend the following tutorials. You'll need to use a snappable protoboard to create a base plate to work from. Snap it to a size that will cover the ESP32 without obscuring the antenna--20 holes by 10 holes. We want to solder down male pins to the underside of the base plate, as shown below. 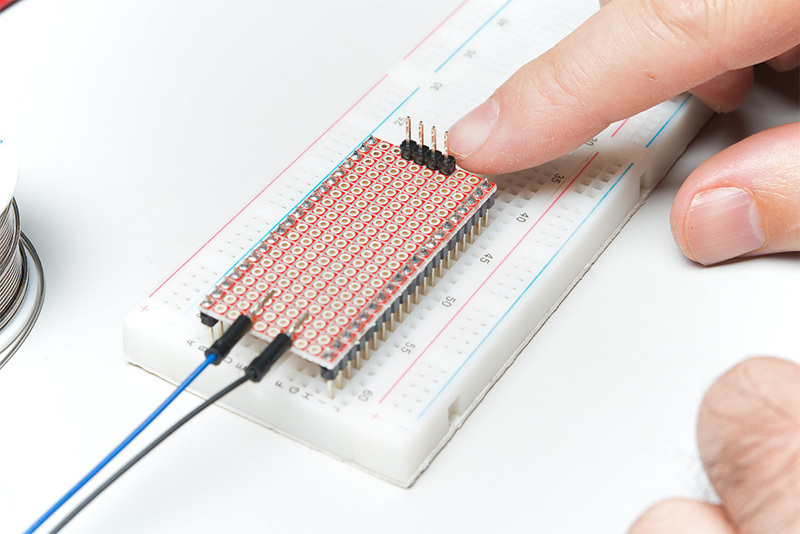 Note the use of a breadboard as a fixture to hold the pins perpendicular to the plate. You'll also need to solder down the wires used to connect to the IoT Relay box. I like to use the cheap jumper wires we sell for this purpose, as the plastic ferrule on the ends provides strain relief. 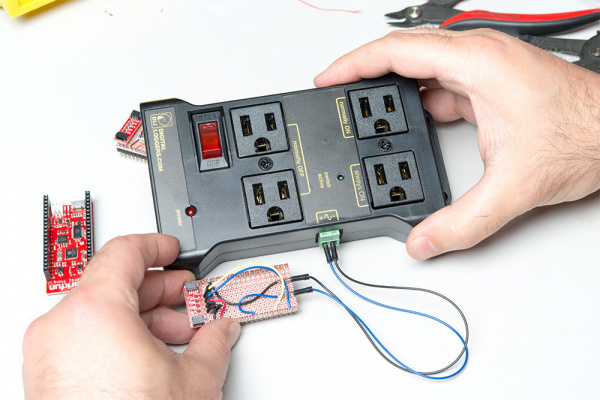 Since we don't have a Qwiic connector handy, we'll use our Qwiic adapter board to provide a Qwiic-compatible connector. Solder the header down as shown below. It should be directly centered on the base plate. 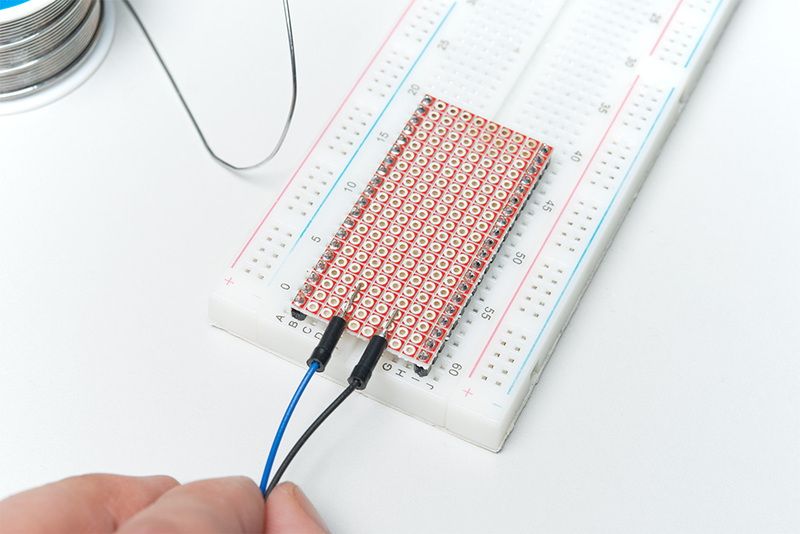 Once you've soldered down the header (you'll need to remove the base plate from the breadboard to access the underside of it), you can solder the adapter to the header on the top side of the board. Route the two wires you soldered on earlier to GND and pin 5 (9th pin down on the right hand side, if the edge that will be closest the antenna is on top). We want female headers on our Thing board to mate with the male headers on the base plate. You'll need to cut to length the female headers from the wishlist. Remember that you'll lose one pin to the cutting, so you need two pieces of the full size header. In the picture below, note how I'm using the base plate to hold the headers perpendicular to the ESP32 board for soldering. It might help to mount the IoT Relay and ESP32 Thing to some kind of base, such as a piece of plywood or even corrugated cardboard, before finishing the assembly. I didn't do that, so I could continue to manipulate the hardware for pictures. Pull the screw terminal out of the side of the IoT Relay. 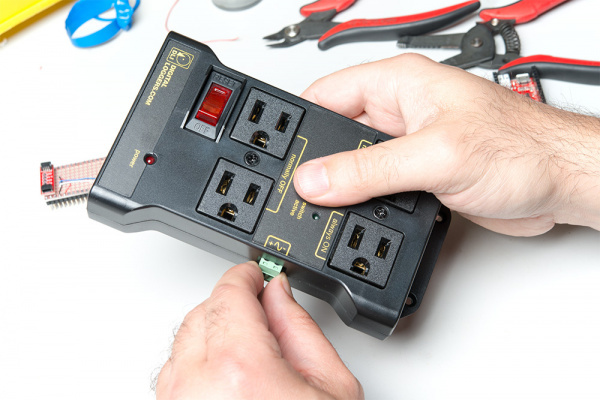 You won't be able to screw down the wires without doing this. 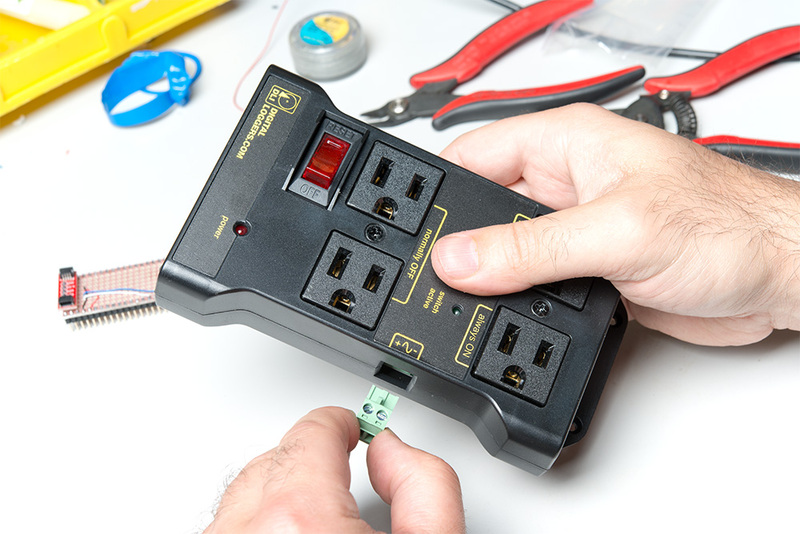 You may now screw the wires you attached to the base plate into the screw terminal block. Note the polarity markings on the IoT Relay box. Make sure you connect the '-' terminal to GND and the '+' terminal to the wire routed to pin 5 on the ESP32 Thing. Now, place the base plate onto the ESP32 Thing. Be careful of the orientation, making sure that the Qwiic connector is on the end farthest from the antenna. Finally, connect the Micro OLED to the Qwiic connector. You'll probably want to affix that to the base along with the ESP32 Thing and the IoT Relay box. I suggest hot glue. With Arduino installed, please make sure you also download and install the ESP32 software support package. And lastly, download the IoT_Power_Relay GitHub repo which contains the firmware you'll be uploading to the ESP32. 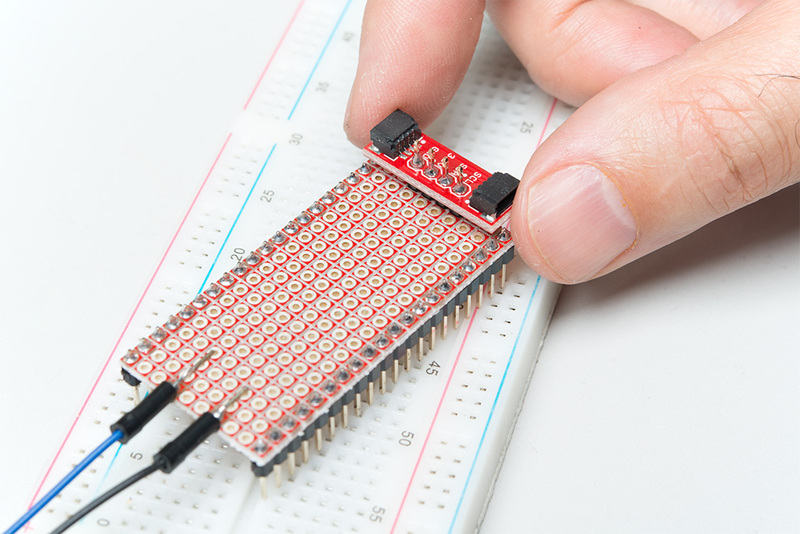 Now that we have our basics, let's go over the code that will be programmed onto the ESP32! This is the core code, in the TeleSitter.ino main file. The includes section holds all the library references needed for this project. time.h is the ESP32 native time library, while TimeLib.h is the Arduino time library. We use both of them because time.h does graceful NTP server synchronization, while TimeLib.h is better for tracking current time and reacting to it. Preferences.h is the ESP32 non-volatile memory support module. Next, we set up a few constant strings: SSID, WiFi password, and the address of the ntpServer we wish to use. "pool.ntp.org" is an open NTP project great for things like this. We use global variables to track the times that we turn on and off our power switch. In the full code, there are four variables for each day. Only Monday's variables are shown here. Here we set up defines for our project. We use pin 5 for controlling the switch because it has an LED on it, making testing easy. 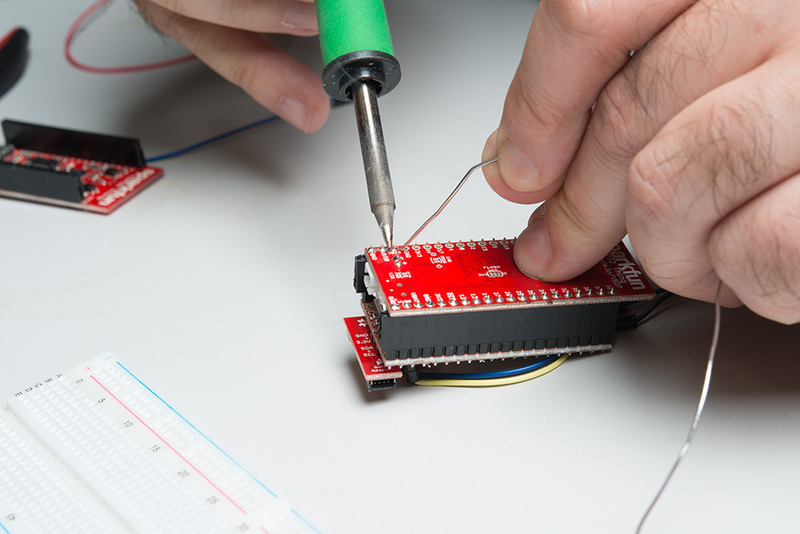 The MicroOLED library requires a reset pin to be defined, even if it isn't used, and requires a note on the status of the jumper on the back of the MicroOLED board. We leave the jumper set to '1', which is the default that it ships with. //  on the PCB, this is what you want. Next we create objects that will be used throughout the code. The port number for the server is passed to the constructor; 80 is the default port for http requests and that number shouldn't be changed. setup(). Does typical setup-y things like printing debugging messages during startup, configuring the serial port and pins, etc. During setup, we try to connect to WiFi. It's been my experience that if the WiFi doesn't connect within 10-15 seconds, it's probably not going to, and the smartest thing to do is reset the ESP32. This section of the code handles that. During normal operation, we can't count on the user to have a computer attached to the ESP32. Thus, we provide the OLED to tell the user what the current IP address is. The ESP32 has an odd way of storing data in non-volatile memory. You must create a region ("TeleSitter", here), and then issue a begin() call to the library. Note that the second parameter to begin() must, per the documentation, always be false. // Enable the server functionality. Timekeeping initialization. Read the comments for more information on how and why the timekeeping is done the way it is. //  to avoid excessive NTP checks. //  here, or an arbitrary time, as used elsewhere. //  most of our timekeeping duties. //  the full year number and ESP stores it as an offset from year 1900. //  once a day at 3am and reset the Arduino clock accordingly. // Set the Arduino clock to DST correct local time. loop(). Starts out by doing a health check on the WiFi connection. IF the WiFi connection is lost, the ESP32 will reboot. //  the ESP to (hopefully) reconnect without user noticing. Every pass through loop, we check our alarm status to see if we should turn the output on or off. We'll talk about what exactly is involved in the alarm checking later. Check if it's 0300 local time or not. If it is, we go through the clock setting process again. We only do this once a day because our clock is good enough to keep time over 24 hours fairly accurately and because we don't want to accidentally activate rate limiting on the NTP server. We do it at 0300 because that is a good time to catch the DST shift. // Check to see if DST is in effect. This code was taken more or less directly from the example code provided with the ESP32 library. It handles incoming requests by serving up the webpage that we will create later, then checking what the nature of the request is and taking some action based on that. Note that, regardless of the request, the webpage is served back. We split the response into several blocks, to make editing easier, and unlike the original example, we make our webpage in constants defined elsewhere. Note the use of printf() in the body printing section. That allows us to push variables from our code to the webpage. //  as it's the only way to check the internal server clock. We expect to get a few types of response from the client that connects to this device. These can be differentiated by the text in the response. For instance, a request for the path reset should trigger a reset of the alarm times, and an HTTP get request that starts with a question mark indicates an incoming string of data that is to be parsed into alarm times. Lastly, we have a few chunks of code that don't really belong anywhere else, so we stick them at the end of the main code. Alarms.ino handles the checking of the alarm times: whether or not the output should be turned on. It calculates the time of the day, in seconds, then calculates the times the output should be on or off depending upon the day of the week. It then does a comparison of those times and takes the appropriate action. NVM.ino handles the various accesses to non-volatile memory that must be managed. This includes setting and resetting the alarm times and loading the alarm times into memory upon startup. Again, I've removed redundant code for the additional days of the week to make things a little simpler to follow. 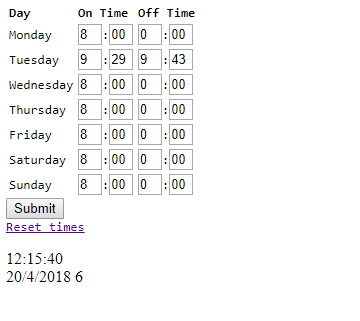 resetAlarmTimes() simply sets the on time to 0800 and the off time to 0000 and then stores it to NVM. storeAlarmTimes() takes the current global alarm time variables and stores them into NVM. Note that storage into NVM is dependent upon data type; we use putInt() because our time data is of type int. getAlarmTimes() is the opposite of storeAlarmTimes(). Note the use of getInt() here to correspond to putInt() earlier. 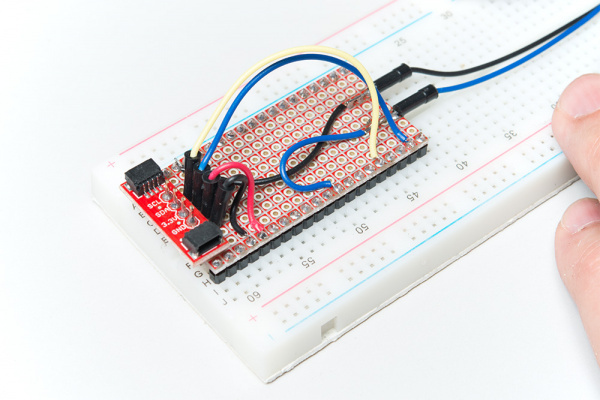 The client responds to a button press by sending a large string of values to the ESP32 Thing. We need to parse those values out into their appropriate hour and minute times. The code in ParseInput.ino does just that. In much of the world clocks are set back by one hour and forward by one hour once per year. In most of the US, this is done (forward) on the second Sunday in March and (back) on the first Sunday in November. dstCheck.ino contains code I wrote for SparkFun's Big GPS clock to automate handling of DST changes. //  project. I wrote that too. //  the offset from UTC by one hour. // We can bail out if month is < 3 or > 11. // We can also bail out if month is > 3 and < 11. //  checks to quickly decide whether the date is a possible one. //  the date is greater than 8, we can return false. // If we *haven't* seen the first Sunday yet, we are in DST still. // If it's *after* the first Sunday, we aren't in DST anymore. //  need to know if the current hour is < 2; at 0200 MST, DST ends. // For March, dates less than 8, or greater than 13 are automatically out. //  to limitations of the compiler used by the Arduino IDE. // If we *haven't* seen the second Sunday yet, we aren't in DST yet. // If it's *after* the second Sunday, we are in DST now. //  need to know if the current hour is < 2; at 0200 MST, DST starts. PageContent.h declares three different page content chunks: a header, a body, and a footer. Those are merely our demarcations and don't actually correspond to HTML concepts with the same name. The header is defined as type String. It contains the http response code information, content type information, and all of the html header information up to and including the opening tag for the page's body content. It also includes some CSS to format the page. Note the use of backslashes to escape the newline at the end of each line. An alternative is to surround each line in its own set of double quotes, but I find this easier to read. The body text is defined as a character array. This is to facilitate use of the printf() command later to insert values into the body text. Not much to see here, just closing up the HTML. Note: To visit the webpage, you'll need to make sure that the device you're trying to use to connect is on the same WiFi network as the ESP32 Thing. The webpage is not visible from the Internet as a whole. Open a web browser and type in the address from the micro OLED screen. This is what you'll see when you load the webpage served by the ESP32 in your web browser. You can update each day's times individually and submit the times using the submit button. To make things a little easier to code, times are in 24-hour format. The current date and time according to the clock on the ESP32 are also displayed. Try adding a device like a lamp to the "normally OFF" outlet. Anything scheduled to be on as indicated by the time should be powered and vice versa. If you are remotely powering the ESP32 Thing, try adding a USB power supply to the "always ON" outlet. W3Schools - This is a great website to help you learn more about writing for the web. I figured out most of how to write the page in this tutorial using W3School's excellent tutorials. Simple WiFi Server Example - The original example that I started with for this project. It may be easier to start with this if you want to customize the server. GitHub Repo - Project repo for the TeleSitter.